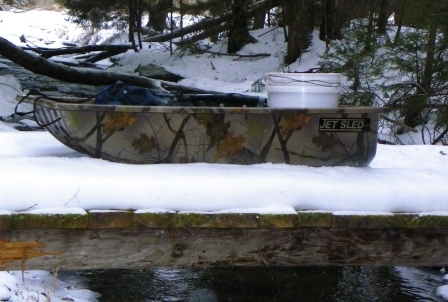 Officially, this is a Shappell Jet Sled 1 – ATC (All Terrain Camo) and it is absolutely not flimsy. The polyethylene tub is rigid and light-weight. It also has a wide stance and looks to be stable, but if anyone is capable of dumping a load of gear in the snow it is me, especially with a product that has “All Terrain” right in its name. Let’s see how it does on the loop around my home waters. This test drive took place over two days. 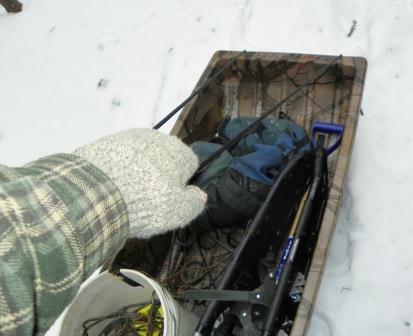 I figure that, between the weight of the sled, ice chopper, traps, snowshoes, drinking water and other miscellaneous gear, I was pulling close to 40 pounds each day. 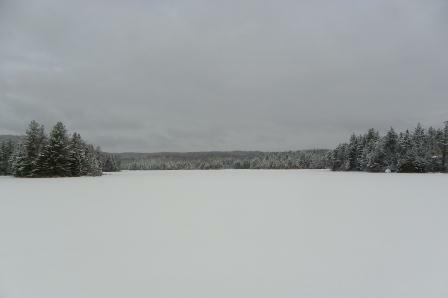 Day 1 was cloudy and 17°F with light snow falling on and off. Trail conditions included a semi-packed snowshoe path, icy crust, foot-deep powder and a stretch of frozen, rural dirt road. Typical January conditions in Vermont. I don’t know why, but I was surprised at how easily the Shappell Jet Sled followed, even loaded and on the frozen dirt road. 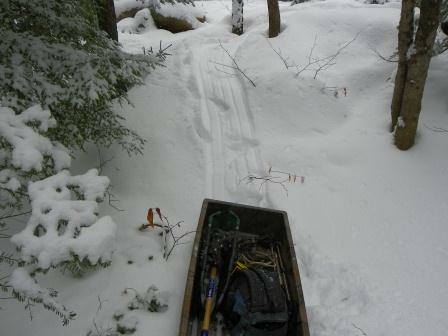 I hesitated at the first few dips and twists in the trail, but the sled handled them well, sliding right along. Pulling uphill wasn’t nearly as difficult as I expected, which is not to say dragging 40 pounds through the woods ain’t work. The Shappell Jet Sled certainly made it easier, though. 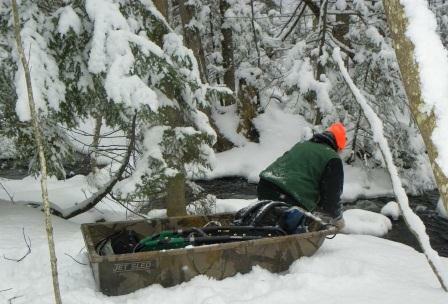 On the flats, this sled has a nice long glide, reducing the effort needed to keep it moving. From the “No Duh” file: Gravity is not just a good idea; it’s the law and I had to step aside on a few downhill stretches and let the sled run ahead, slowing it with the rope from behind. Where the trail was narrower, though, I had to work at not getting run over and wound up on my face, once, when the sled got up on the tail of a snowshoe. I also let it get away from me at one point and it crashed, hard, into the trunk of a large hemlock. No damage, even though it was cold enough to make most materials brittle. Day 2 was cloudy and 20°F with light to moderate snow falling throughout the afternoon. 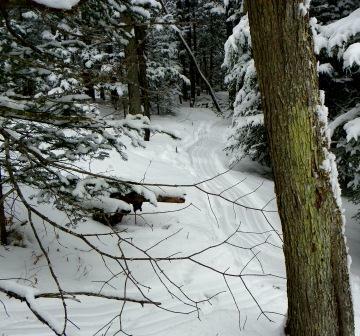 Trail conditions were the same but with six inches of new snow on top (except for the road, which was recently plowed). 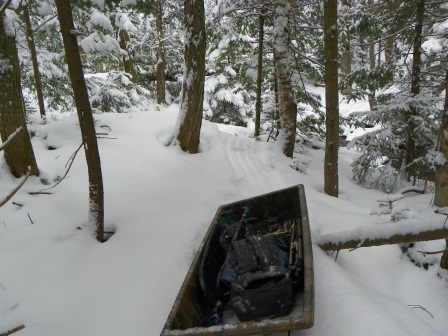 Using what I learned the day before, controlling the Shappell Jet Sled on the downhills was less of a challenge and I decided to take it further off the trail, deeper into the woods and down to a swamp. 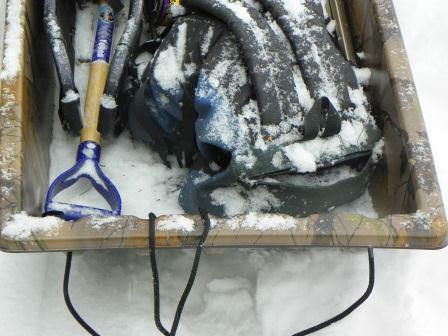 The snowshoes stayed in the sled as I threaded my way through narrow gaps and over obstructions I couldn’t see beneath the snow. I deliberately chose a difficult route, just to see what would happen. I know that, sooner or later, I will tip this thing over but if I do it will be harder than I thought. One thing I found, though, is that the inside of the tub is slick and I had some issues with my load shifting. 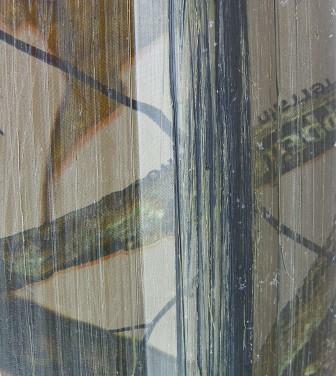 I will probably stick down some traction tape (like on stairs) or maybe an old piece of carpet to help with that. Snow was falling as flakes from the sky but it was also coming down as globs from the trees as I bulled my way through, and a lot of that snow ended up in the sled. This made the tub slicker, not to mention complicating the handling of the gear within, which is probably why Shappell offers fitted covers for their sleds. I’m not usually an accessory kind of guy but a cover sure would be nice. I took this Shappell Jet Sled into the woods, tried to tip it over and crashed it into a tree. I dragged it over ice, snow, rocks, logs and gravel and for the most part I am pleased but what else (besides making my days in the woods easier) is it good for? That is always an important consideration with any new product or tool I bring home, and I don’t mean “will it make a nice coffee table” or “how many bags of concrete can we mix in it”. I keep chickens and this sled has already saved me a few trips from the barn to the coop, hauling bedding straw, shavings and feed. 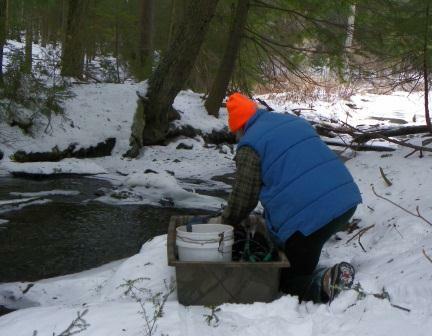 I also use a pellet stove for heat, stashing five 40 pound bags at a time in a cubby near the stove. That’s five round-trips across the dooryard, or at least it used to be. Now I can deliver 200 pounds of pellets to my door in one fell swoop. The long and the short of this whole thing is that I wish I had gotten my mitts on a Shappell Jet Sled before now. 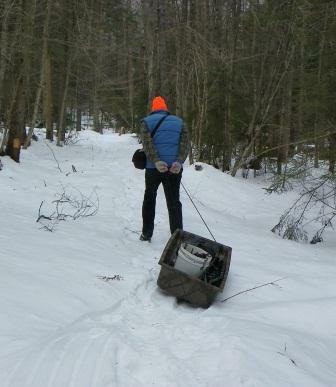 Whether it’s for transporting straw and feed, bags of wood pellets or hauling more gear than I really need, deep into the woods, I have decided a Shappell Jet Sled is the way to go and if it starts to look like all that dragging is going to wear through the bottom, Shappell has that covered, too. I put a few scuffs, scratches and dings (along with a couple of deep gouges) into the runners on the bottom of this sled but Shappell also carries Wear Bar kits to reinforce the runners and extend the life of the sled bottom. 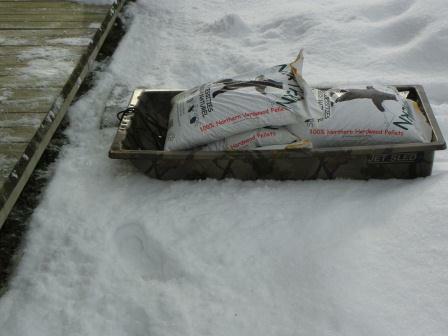 I’ll probably look into that in a season or two because this sled is a keeper. I should have had one long ago. I am not affiliated in any way with the Shappell Corporation. My (real) name was drawn from a virtual hat and I received the Shappell Jet Sled 1 – ATC in exchange for agreeing to use it and post an honest review. That’s all I get; the sled. Anyone who knows me knows I am honest and it would be a disservice to my readers, myself and the people at Shappell to have done this any other way. Fantastic gear review! Loved all the photos and explanations of what you were doing and putting the sled through. Time to add a Shappell Jet Sled to my need to purchase for the Great Outdoors list. hey Quill. you are mighty quiet up there……ya’ll ok? Owl! All is well; just had some real world stuff to take care of. I am back now.